"Draining our Glass: An Energy and Heat Characterization of Google Glass"
Sony and Stanford University files a patent application US20140231620 "Image sensor and imaging method with single shot compressed sensing" by Yusuke Oike and Abbas El Gamal aimed to save the image sensor power: "Low power consumption is a primary concern in many CMOS image sensor applications. As the resolution of these sensors has increased while maintaining or increasing their frame rate, the analog to digital conversion (A/D) associated with the sensors has become a dominant component of power consumption. Typical image compression techniques reduce the readout rate (and hence the I/O power consumption), but cannot reduce the power consumption associated with the A/D conversions." So, the application proposes to modify the image sensor readout architecture so that compressed sensing techniques can be applied to save power. The idea is to divide the pixel array into small blocks 12 and add a MUX at the ADC input combined with an ADC activation generator "generating a random activation code that determines which of the plurality of A/D converters is activated; and obtaining a digital read-out of the analog signals from the activated A/D converters." "According to compressed sensing a compressible signal can be recovered from a small number of random measurements by sparsity promoting non-linear recovery algorithms. Therein, the number of A/D conversions represented by M can be sufficiently less than the number of pixels in a unit of pixel block represented by N, to recover the original image. When M number of A/D converters are simultaneously dedicated to N pixels, the image sensor outputs M digital codes for the N pixels so that the compression ratio M/N can be sufficiently less than 1. The power consumption and bandwidth of both the A/D conversion and input-output transmission can be suppressed by a factor of M/N in comparison to a normal operation wherein N, A/D conversions are required to obtain an image of N pixels. For example, 16 A/D converters dedicated for a unit of pixel block of 256 pixels achieves a compression ratio of 1/16. Note that the compression ratio can easily be varied by changing the number of A/D converters dedicated for a unit of pixel block at the multiplexers. Further, this feature also enhances the frame rate for a given power consumption level, as frames are outputted at the rate of N/M"
Toshiba (TOKYO:6502) will focus on development and sales expansion of automotive and medical imaging sensor, in addition to sales expansion with Chinese smartphone manufacturers based on the BSI (backside illumination image sensor) technology and technologies that realize high sensitivity and speed. The current image sensor market is mainly for smart phones and digital cameras and has a scale of approximately 800 billion yen . Future growth is expected on such factors as expansion to automotive applications and bringing higher performance levels to existing applications. The volume zones for image sensor used in the main cameras mounted on current smartphones are 8- to 13-million pixels. Toshiba supplies products mounting high-sensitivity image processing technology such as HDR and Bright Mode. We have already developed a 20-million pixels sensor for high-end market. We are meeting customer needs by developing more cost-competitive products. Currently Toshiba sells sensor for view camera. We will use our original HDR to develop automotive image sensors, as demand for such products is expected to expand in the future. We will propose a system with TMPV75 Series, our automotive image recognition LSI, so as to expand sales to both domestic and overseas customers. We have formed an alliance with and invested in CapsoVision, Inc. (CV), maker of a capsule endoscope, as one aspect of promoting Toshiba’s healthcare business. We are now developing image sensor to mount in CV capsule endoscopes. We are also considering entering the market of sensors for catheters or endoscopes. : HDR (High Dynamic Range) is a function that captures high contrast scenes naturally by widening the range of light and dark tones. Toshiba has developed HDR for video as well as still images in both high light and dark contrast settings. Our HDR synthesizing realizes smooth and vivid video recording by suppressing blurring and false colors. : Bright Mode is a technology to realize bright high speed movie recording. It can record movies that are up to 4 times brighter than those shot in normal mode. It can also record at frame rates as high as 240 frames a second in full HD equivalent by adopting an interlaced format. Toshiba provides high quality video technologies required for high speed video and for such features as smooth slow-motion playback, etc. The new PR joins a series of similar ones on LSI strategy, discrete semiconductors strategy, and storage products strategy. PRNewswire: During the last fiscal quarter ended on July 31, 2014, Omnivision shipped 249 million sensors. The non-GAAP gross margin was 22% and net income was $54M, bringing the company cash and short-term investments balance to $524M. Revenues for the quarter were $406.5M, as compared to $331M in the previous quarter, and $373.7M a year ago. The company expects revenues in the next quarter will be in the range of $360M to $390M. "The Company's Board of Directors is reviewing and evaluating HCM's proposal. No decision has been made with respect to the proposed transaction. And there are no assurance that this or any other transaction will be consummated. We are focused on our operating our [bench] (ph). We do not intend to provide update with respect to this or any other transaction except as required by applicable law. We think you in advance for your understanding." 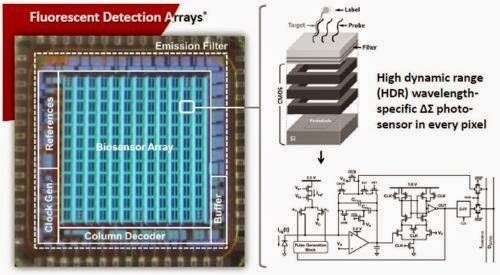 "We are also developing a full complement of ASIC with advanced image procession functions by combining our sensors with image processing and other peripheral functions. We can offer our customers with complete imaging system solution, such as in our machine vision products. In our core smartphones, tablet and PC market cameras are enabling new application such as capturing 3D depth information using computational photography to improve image quality and developing new human interface applications. We have partnered with industry leaders to enable 3D depth sensing for both smartphones and tablets." "We are extremely pleased with our success in China and we expect this market will continue to be a major driver of our future goals." "We expect India to rapidly grow to become a significant geography for OmniVision over the next few years." In our first fiscal quarter, we shipped 249 million units, as compared to 201 million units in our prior quarter. The increase in volume was predominately driven by increases in 5-megapixel and HD sensors. The average selling price in our first quarter was $1.63 as compared to $1.64 in our prior quarter. "Unit sales of 3-megapixel to 5-megapixel category represented approximately 40% of total shipments as compared to 34% in the prior quarter for the same category. The significant increase in unit shipments in this category was predominately driven by larger 5-megapixel sensor shipments to the mainstream smartphone segment in Asia." EETimes: Hindustan Semiconductor Manufacturing Co. (HSMC), Semiconductor Manufacturing International Corp. (SMIC) and three private equity groups Hahn & Company, Askveritas and Bain Capital have expressed interest in acquiring image sensor foundry Dongbu HiTek. Dongbu and its main creditor, Korea Development Bank, agreed to select the preferred bidder in September 2014. Some of the past and current Dongbu customers are Pixelplus, SiliconFile, SETi, Clairpixel, Rayence, Foveon. Business Wire: TowerJazz Panasonic Semiconductor Co. announce its first third party CIS customer, Himax Imaging, that is developing the next generation high end cameras for smart phone applications using TPSCo’s 1.12um pixel. The pixel incorporates cutting edge light loss reduction technologies using a proprietary 65nm process, allowing 1.12um pixel with a QE of 74%. Through proprietary design and processing the dark current at 60C is measured at 6.5 electrons per second, and the readout noise is 0.9 electrons. "Himax Imaging has been focused on delivering high value image sensors to mobile, consumer, surveillance and automotive markets with our ultra low power and low noise architectures. After extensive evaluation of TPSCo’s 1.12um state of the art pixel, we believe that our architecture combined with TPSCo’s advanced 65nm CIS process, which provides extremely low dark noise, high quantum efficiency, and excellent angular response, will enable DSC quality performance for our next generation of high resolution image sensors," said Amit Mittra, VP and CTO of Himax Imaging. "We are very pleased that Himax Imaging is putting their trust in TowerJazz and is now working with us through TPSCo to enable technological advances for its next generation products," said Avi Strum, VP and GM, CMOS Image Sensor BU, TowerJazz. "By utilizing the advanced features of our 1.12um-pixel CIS 65nm process, Himax Imaging will offer evermore innovative technology to meet their customers’ -- some of the world’s leading device manufacturers -- growing demands for both high quality, yet cost-effective, cameras for high end smart phone applications. We are excited to work with Himax Imaging and look forward to more product engagements in the future," said Guy Eristoff, CEO, TowerJazz Panasonic Semiconductor Co.
TPSCo’s 1.12um-pixel CIS platform includes: advanced 65nm specialty process for CIS, color filters and micro-lenses, stacked light pipe technology for enhanced optical performance, optical/device simulations design optimization, operating voltage of 1.2/1.8/2.8V, 4LM metallization (3LM-Cu and 1LM-Al) and 32nm pitch M1. For mobile and DSC applications, the features include: high resolution sensors, demanding frame rate, high sensitivity and dynamic range, low dark current, and high angular response performance. Reuters adds that, according to its sources, "the deal would bring in $20 million a year in revenue for the [TowerJazz-Panasonic] joint venture"
The Society of Motion Picture and Television Engineers (SMPTE) announces its 2014 award winners. "The Camera Origination and Imaging Medal honors the recipient by recognizing significant technical achievements related to invention or advances in imaging technology including sensors, imaging processing electronics, and the overall embodiment and application of image capture devices. Eric R. Fossum will receive the 2014 award in recognition of his leadership in the invention and development of the complementary metal-oxide-semiconductor (CMOS) active pixel sensor (APS) technology. This advancement was first published in 1993 while Fossum worked at NASA's Jet Propulsion Laboratory. Additionally, he promoted the new technology to a broad range of manufacturers as a new way of making camera image sensors. CMOS image sensor technology is now widely deployed in motion picture and television cameras, cell phones, medical devices, security systems, and many other professional and consumer applications." Nature: A group of researchers propose a photography which uses light that has not interacted with the object being photographed. "This form of imaging uses pairs of photons, twins that are ‘entangled’ in such a way that the quantum state of one is inextricably linked to the other. While one photon has the potential to travel through the subject of a photo and then be lost, the other goes to a detector but nonetheless 'knows' about its twin’s life and can be used to build up an image. One advantage of the technique is that the two photons need not be of the same energy, Zeilinger says, meaning that the light that touches the object can be of a different colour than the light that is detected. For example, a quantum imager could probe delicate biological samples by sending low-energy photons through them while building up the image using visible-range photons and a conventional camera. The work is published in the 28 August issue of Nature." "Quantum imaging with undetected photons"
"Our experiment is fundamentally different from previous quantum imaging techniques, such as interaction-free imaging or ghost imaging, because now the photons used to illuminate the object do not have to be detected at all and no coincidence detection is necessary. 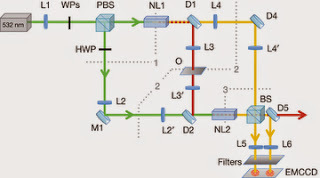 This enables the probe wavelength to be chosen in a range for which suitable detectors are not available. To illustrate this, we show images of objects that are either opaque or invisible to the detected photons. Our experiment is a prototype in quantum information—knowledge can be extracted by, and about, a photon that is never detected." The implementation is quite complex and, probably, can only be used in specialized niche applications, if at all: "Our experiment uses two separate down-conversion nonlinear crystals (numbered NL1 and NL2), each illuminated by the same pump laser, creating one pair of photons (denoted idler and signal). If the photon pair is created in NL1, one photon (the idler) passes through the object to be imaged and is overlapped with the idler amplitude created in NL2, its source thus being undefined. Interference of the signal amplitudes coming from the two crystals then reveals the image of the object. The photons that pass through the imaged object (idler photons from NL1) are never detected, while we obtain images exclusively with the signal photons (from NL1 and NL2), which do not interact with the object." Business Wire, PR Newswire: Toshiba launches T4KA7, a 1/2.4-inch, 20MP BSI sensor enabling 6mm z-height camera modules for smartphones and tablets. The new sensor features 1.12um pixels and improved frame rate of 22fps, 1.8 times faster than that of Toshiba’s previous 20MP sensor. T4KA7 sample shipments start today. A reference module incorporating the new product is currently under preparation and will be available from Sept 1. Markets and Markets publishes its "3D Sensor Market by Technology" report. The company analysts expect the 3D sensor market to reach $3.4B by 2020 at a CAGR of 23.43% in 2014-2020. 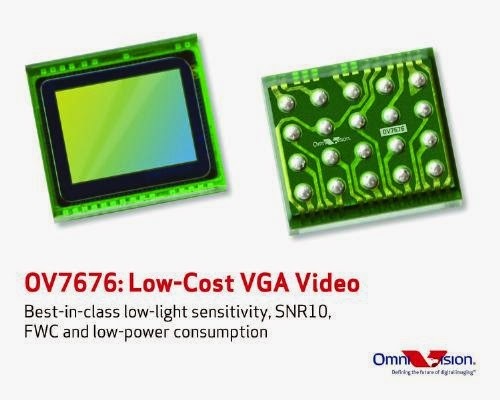 PR Newswire: OmniVision announces the OV7676, a cost-effective 1/7.5-inch VGA SoC for mobile phones, tablets, wearables, notebooks, and IP network cameras. Built on mature 3-micron OmniPixel3-HS, the OV7676 is said to have best-in-class low-light sensitivity, SNR10 figure, full-well capacity, quantum efficiency and low-power consumption. The OV7676 also supports video-in-video functionality, allowing users to simultaneously record video feeds from both the front- and rear-facing cameras in smartphones, tablets and notebooks. "The OV7676 is uniquely positioned to deliver high-level performance to a diverse range of consumer devices that have stringent requirements on function and value," said Paul Gallagher, senior director of marketing and business development at OmniVision. "With more mainstream devices incorporating cameras in their designs, we believe the OV7676 is ideally suited to meet the demands of this particular product segment. Likewise, the OV7676 can also serve as a cost-effective camera solution for emerging applications, such as IP security cameras and wearable devices." One has to note that the recommended reflow temp profile is quite delicate - most common reflow processes have heat peaks at 245-250C. Sharp Japan web site publishes an announcement of RJ5DY1BA0LT, the 12MP, 1-inch image sensor capable of 4K2K video at 60fps. The sensor is based on 3.1um pixels with 1420mV/lux-sec sensitivity (3200K light source, F5.6). 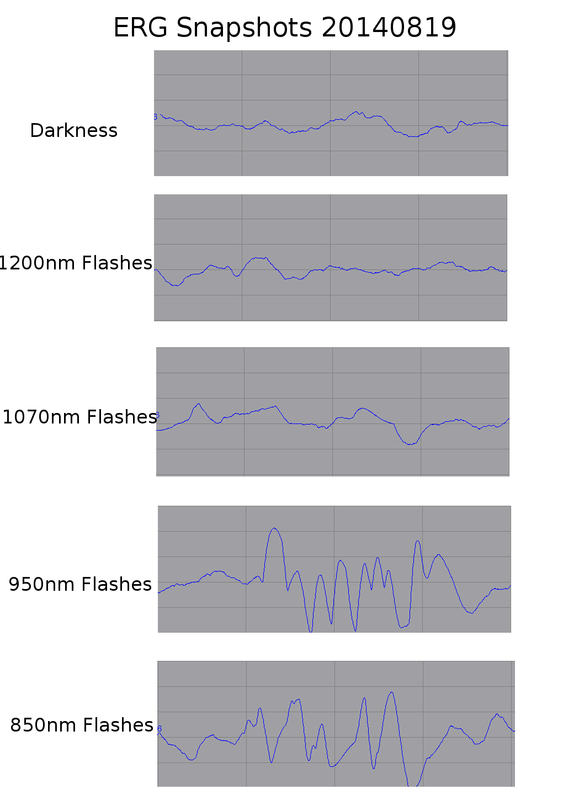 When shooting 4K/60fps video, the sensor consumes 420mW, said to be the lowest power in the industry. The rumor is that Heptagon has acquired Swiss ToF camera and image sensor maker MESA Imaging. MESA ToF cameras and sensors are mainly used in industrial applications, while Heptagon is oriented to mass market wafer optics used in many camera phones. The synergy between the two cameras is not clear to me. Mantis Vision's CTO, Gur Bittan presents "Mobile Depth Sensing Methods and What They're Good For" at GPU Technology Conference held in March 2014. One can download the presentation video here or see it below. 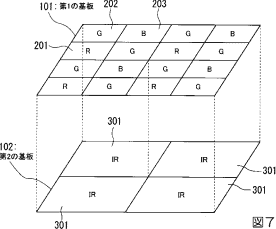 Egami blog publishes Olympus Japanese patent application 2014-135535 proposing a 2-layer RGB-IR sensor. The main purpose is to remove the need in IR-cut filter. 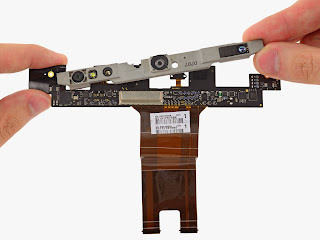 iFixit teardown shows that Mantis Vision structured light camera is responsible for Google Project Tango tablet 3D vision. The teardown team quotes Google: "The IR projector is from Mantis Vision, and designed specific to our specs for field of view and resolution. It is custom designed to work in partnership with the 4MP RGB-IR camera on the other side." Business Wire: ON Semiconductor announces the completion of its acquisition of Aptina Imaging. ON expects to establish a new reporting segment, which will incorporate the financial results of the company’s consolidated sensor businesses, including the recent acquisitions of Aptina Imaging and Truesense Imaging, and ON Semiconductor’s existing optical, image and touch sensor businesses. The company expects to begin reporting financial results for the newly created segment from Q3 2014. Taner Ozcelik, has been named SVP of the Aptina image sensor business and will report to Keith Jackson, president and CEO of ON Semi. Before the acquisition, Taner Ozcelik used to be Aptina SVP responsible for the Automotive and Embedded business. For the Q3 2014, the acquisition of Aptina will likely contribute revenue in the range of $60M to $70M. Excluding the costs related to restructuring, and other acquisition related items, the acquisition of Aptina is expected to be slightly accretive to the ON's non-GAAP net income in Q3 2014. "The new epc610 Evaluation Kit is a significant upgrade from the former version. We opted for a completely new hardware design of the camera module. This module is based on our thorough background on TOF and incorporates the recent learnings from our customers. A first novelty is an LED subsystem, which is optimized to illuminate the operation range in a more uniform way. Seven LEDs (Osram SFH 4059) are placed at the edge of the camera PCB. These LEDs cover the more distant operating range. Together, they deliver a high intensity, but due to the placement away from the receiver lens, their effect drops drastically at close range. This is where the single short range LED jumps in. Placed close to the receiver lens this single LED is much better suited to delivering light on to close objects, while its effect fades when the targets move further away. The result of this design is an illumination intensity with reduced peaks at certain distances. On signal level, this translates to a lower dynamic range that needs to be covered by the the detector system. Ask your sensor specialist and he will tell you why he likes that! With this design, the epc610 Camera Module works in a range from zero up to about three meters – depending on the target reflectivity." As written in comments to the previous post, Taiwan-based LIPS posted Youtube videos demoing a 3D camera based on combination of ToF and stereo. No explanation of the technology is given, other than saying it's compatible with Primesense openNI 1.5 and 2.x software. "I see the key applications in the area of control, security, visualization and reproduction. Significant market opportunities lie ahead in general-purpose computing/communications platforms (notebook/tablet/smartphone) as well as in fixed function appliances." "The area of end application concepts, software and infrastructure are major areas of activity today. Once fully deployed, the impact of 3D imaging technology on our everyday life will be transformative in the same way the internet was: it will fundamentally change how we do things." "Imec developed a CMOS compatible CCD module and included this into its custom imager 130-nm process... Imec implemented a number of process modifications to realize a CMOS compatible CCD module in its 130-nm custom image sensor technology platform. The embedded CCD module uses a single layer poly-silicon CCD electrode with narrow gaps to allow efficient charge transfer. It is customizable depending on application needs, and is compatible with back-side illumination." "Embedded CCD, being a CCD compatible with CMOS operating voltages, opens possibilities for new and rich pixel architectures. For example, users could utilize an in-pixel CCD to implement a charge-domain global shutter functionality. Although this concept to image a full frame at the same exact timing is possible using CMOS imagers, it generally comes with a noise penalty. Other possible uses of embedded CCD pixels include extreme high-frame rate burst imagers, where subsequent frames are stored inside the pixel using small CCD based analog memories. Certain time-of-flight implementations could also benefit from this technology. In addition to monolithic TDI applications for industrial inspection, TDI functionality is also used in hybrid infrared and x-ray imagers." Aptina has shipped 50 millionth image sensor for automotive systems. The company estimates that nearly one in every two cars with an imaging solution uses an Aptina image sensor. The company sees this as an important milestone in its ten years of focus on automotive imaging. Nikkei says that Sony has developed a sensor for automotive applications, which is "10 times as sensitive to light as existing chips, allowing for easier detection of objects in dark environments. The sensor can provide a color display of the surrounding area even in moonlight, enabling it to detect obstacles more readily than a driver can." Sony plans to start mass production of the sensor and begin sales to automotive equipment manufacturers in the latter half of 2015. The new sensor is expected to appear in car-mounted devices in 2016. Aptina and OmniVision are leading the automotive image sensor market now. "But Sony aims to eventually pick up 50% of the market." Annual production of smart cars equipped with many cameras is expected to reach 100 million vehicles by 2025. Fox Business News, Seeking Alpha, WSJ, Barron's: Omnivision says it received a $1.64 billion takeover offer from a Chinese investor group led by Hua Capital Management Ltd. The investor group includes state-owned Shanghai Pudong Science and Technology Investment Co. Omnivision's board is reviewing Hua's proposal, and has made no decision yet. Update: Here is the official Omnivision statement on the offer. "Sequentially timed all-optical mapping photography (STAMP)"
"An image data set captured by the image sensor or an audio file captured by the microphone may be searched for the presence of predetermined conditions to reconfigure user settings. For example, if User A likes the room kept at 65 degrees in the winter, while User B likes the room kept at 72 degrees in the winter, an HVAC controller may recognize the presence of either User A or User B to change the default settings to the preferences of that particular user. In addition, the HVAC system controller may be programmed to prioritize one user over another user. In another example, an HVAC system may be configured to cool a house when the temperature rises above 72 degrees. However, if an image sensor attached to an outdoor unit captures an image of User C or User D in the back yard, the HVAC system may override the default settings and suppress the cooling operation until User C and/or User D leave the back yard. This may be done to suppress the noise generation by the outdoor unit, or for various safety considerations. If User C is a small child, the operation of the outdoor unit with a high speed fan may present a safety consideration. If User D is typically present to mow the yard, presence of this individual may be a condition to trigger shut down of the outdoor unit to avoid grass being sucked into the outdoor unit, and clogging the heat exchanger." "Backside illuminated technology (BSI) is now becoming standard, even in custom sensors. This, coupled with 3D packaging with dense interconnects, is creating an exciting opportunity in stacked sensors. We are currently working on projects utilizing pixel level interconnects in 3D stacked devices." "Forza Silicon team is in the process of developing a compact, low-power 3D sensor technology that can enable a wide range of smart applications in the programmable world (otherwise know as the "Internet of Things")." "I expect a big impact of stacked image sensors, not so much on the image sensing quality but rather at the system integration level, which will enable smart and very compact imagers for both consumer (e.g. mobile phone) as industrial inspection and security imaging systems." "The additional functionality offered by stacking is the potential of an area distributed pixel readout right underneath the pixel area, which allows a very fast or high dynamic range readout, a local analog-to-digital conversion, local image processing or combinations of above." Business Wire: Aptina is in mass production of the ASX344AT SOC for backup cameras. The 1/4-inch, 5.6um pixel VGA resolution ASX344AT delivers 180 degree viewing with de-warp functionality. The National Highway Traffic Safety Administration (NHTSA) found that 180 degree camera solutions provide a nearly 60% improvement over traditional mirror-based systems and a nearly 15% improvement over traditional 130 degree viewing systems for backup accident avoidance. "The ASX344AT is a comprehensive, robust imaging solution for automotive backup cameras and further expands our industry-leading automotive portfolio," said Taner Ozcelik, SVP of Business Development at Aptina. "By incorporating robust image processing with leading image sensor technology into a single solution, customers will be able to accelerate their time-to-market and reduce overall system costs." The ASX344AT meets AEC-Q100 qualification with operating temperatures of -40°C to +105°C. Reuters publishes an article on automotive camera market potential, largely based on views of Mcnex, Korea's biggest car camera vendor. High-end cars carry as many as eight cameras supporting wide range of applications from parking to emergency braking. Eventually, this number can reach 12 when cameras replace side-view mirrors. Once these camera technologies reache mid- and lower-end cars, the market can grow seven-fold from 2011 to nearly $6.6B in 2018, according to TSR. Automotive cameras have to be far more robust than camera phones. They must withstand tests that include days of submersion in water and 1,000 hours of cycling temperature within seconds between -40C to +85C. "Vehicle cameras are completely different from mobile cameras in terms of specifications. Phone camera makers have had to face a steep learning curve," said Lee Hyo-cheol, a principal research engineer at Korean auto parts maker Hyundai Mobis. "It is very difficult to enter the automotive camera market from supplying mobile phone cameras, especially the complicated front camera market," IHS senior analyst Helena Perslow. Cameras for cars are priced around $32 each compared with $4 for phones, according to Mcnex, which earned 19 percent of revenue last year from car cameras versus 2 percent in 2007. Prices could fall, however, as volume grows. About 83M car cameras are likely to be sold in 2020, five times more than in 2012, according to IHS Automotive. By comparison, shipments of smartphones - which generally feature two cameras - will likely grow 6% in 2018 from 39% last year, according to IDC. Panasonic and Sony lead in parking cameras, according to IHS, and Continental AG, Robert Bosch GmbH and Autoliv Inc dominate front cameras. CMOSIS has acquired Swiss AWAIBA Group (including its Portugal and Germany branches). AWAIBA develops and markets innovative line-scan CMOS imagers for industrial web inspection, sub-mm-sized CMOS camera modules for endoscopy, and on-board automotive cameras. The transaction has been closed on August 4, 2014. "The acquisition of AWAIBA is a natural fit for CMOSIS. It strengthens our presence in existing markets and expands our activities in adjacent segments with complementary image sensor products. It also strengthens our relationship with our existing customer base," stated Luc De Mey, CMOSIS Chairman and CEO. "The acquisition became possible after TA Associates stepped in as a strong financial partner of CMOSIS earlier this year. This enabled horizontal expansion and growth acceleration. AWAIBA is a profitable and well-established brand with an attractive and strongly growing client base. We are very excited to welcome their experienced team having an impressive track record of innovation and deep understanding of customer needs. This permits us to even better serve our customers as an independent and pure-play supplier of CMOS image sensors." "AWAIBA and CMOSIS are joining forces. This allows AWAIBA to secure the financial, human and technological resources for the development of next-generation line-scan and sub-millimeter sized image sensors," commented Martin Waeny, AWAIBA founder and CEO. 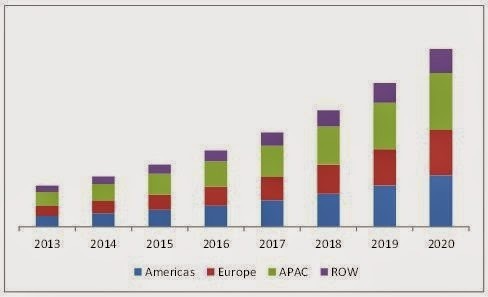 "The newly combined entity will take a much stronger position as a leading supplier of high-quality CMOS image sensors in the consolidating markets of advanced image sensors." CMOSIS' announcement came a week after e2v annouced its intention to buy Spanish Anafocus. Optics.org publishes an article on the acquisition and analysis of the consolidating European image sensor scene. Korea IT Times: SK Hynix aims to expand its image sensor sales to Chinese smartphone makers. 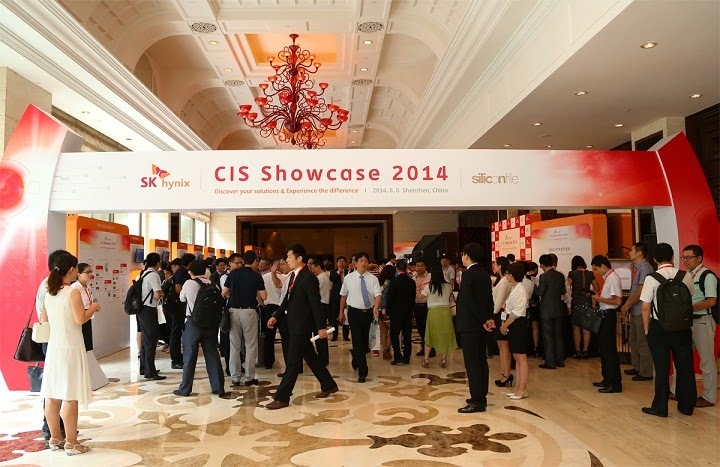 In the past, SK Hynix has focused on low-end products, but now the company plans to enter high-end market. In addition to the 13MP sensor for mainstream smartphones, SK Hynix also showing to potential customers a 21MP model under development now. SK Hynix official said: "We will strive to increase the sales of high-pixel products by applying the new light-concentrating technology onto 13-megapixel-plus CMOS image sensors." Pixart reports its Q2 2014 results. The revenues of NT$1.26B (~$41.97M) are 5.5% higher than the previous quarter and 8.3% higher than a year ago. Net profit is NT$104M (~$3.46M), 13.2% higher than in Q1 and 65.1% higher than a year ago. The gross margin for half a year period is 44.7%, up from 40.8% a year ago. 200-Word Summary: Please submit a 200-word text-only summary suitable for early release. If accepted, this summary text will be published prior to the meeting in the online or printed programs promoting the conference. 500-Word Abstract: Please submit a 500-word text-only abstract for technical review purposes unless the individual call specifies otherwise. SPIE is authorized to circulate your abstract to conference committee members for review and selection purposes. Only original material should be submitted. "Shipment of low-end CMOS image sensor ... had some negative impact on gross margin in Q2. Although it is expected that more sales from higher-end CMOS image sensor and smartphone driver IC in Q3, pricing remains competitive." 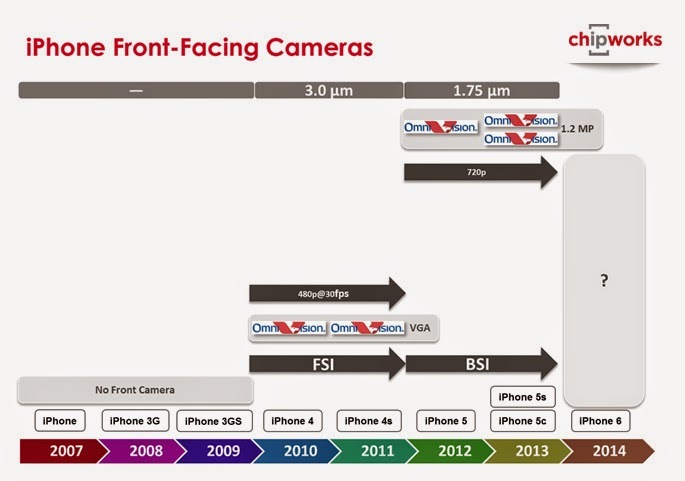 "The CMOS image sensors delivered another strong quarter in Q2, up over 20% sequentially. The Company’s existing 2 and 5 megapixel CMOS image sensors are producing good sales from select international brands and Chinese white-box customers. However, the Company is experiencing some delay in design-in process with its customers to replace older generation sensors with new designs. Such delays will have a negative impact on the corporate gross margin. 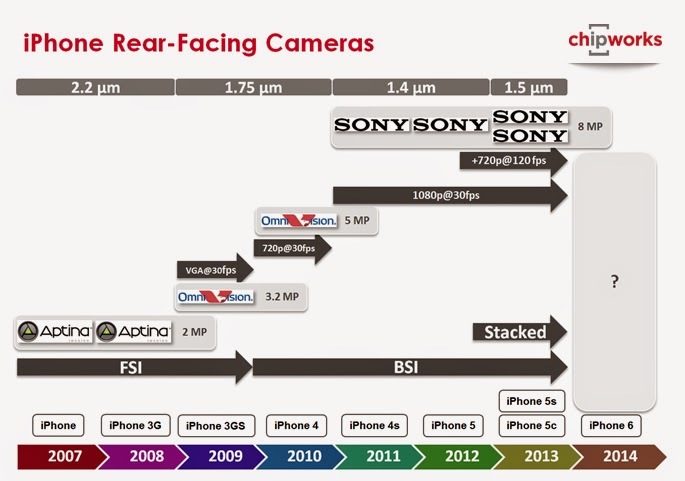 It is expected that the 8 megapixel sensors to start small volume shipments from Q3. The 8 megapixel sensor products will contribute to sales growth and better gross margin as they enter mass production. The Company recently launched its first 13 megapixel sensor, which positions us among a small group of players with such high end offering. Additionally, following multi-year design efforts, the Company now has a competitive CMOS image sensor product line for automotive and surveillance applications, both large, lucrative and fast-growing markets. This is a market with a high entry barrier where special know-how is required. Collectively, it is expected that the CMOS image sensor business to more than double in 2014. The current strategy for the CMOS image sensor business is to focus on increasing shipments and gaining market share. The gross margin for this business will improve when we successfully replace certain old generation designs with new ones and the higher end products, initially 8 megapixel and then 13 megapixel products; comprise a larger portion of the revenue mix. Looking further ahead, the contribution from sensors for automotives and surveillance applications will further improve the gross margin of this product line." "Last but not least, the Company has been working with several industry leading partners using its unique and industry-leading wafer level optics, or WLO, for the development of three exciting product areas of the future, namely array cameras, certain special purpose sensors and microdisplay light guides for wearable devices. Such development sometimes involves the capabilities of its in-house CMOS image sensor, LCOS microdisplay and video processing algorithm teams. Himax is in a unique position in these exciting new technology areas in that it is the only player in the marketplace which is able to provide a total solution. 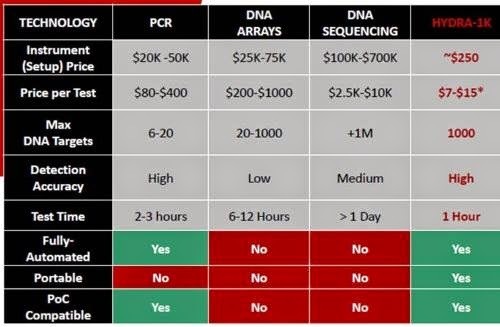 The Company is excited to be in the forefront of such technological developments thanks to many years of technological innovation which leads to a unique product portfolio covering the full range of image processing related knowhow." Business Wire: "High Speed Camera Market by Usage, Component, Accessory, Application & Geography - Global Trends & Forecasts to 2014 - 2020" report estimates the global high speed camera market to grow from 4339 units in 2014 to 7312 units in 2020. The market revenue is expected to grow from $200.27M in 2014 to $274.46M in 2018 at a CAGR of 5.39%, fueled by the growing industrial applications. Toshiba Announces 8MP 1.12um Pixel Sensor. Business Wire: Toshiba announces T4KA3, an 8MP, 1.2um BSI pixel CMOS sensor for smartphones and tablets. The 1/4-inch T4KA3 incorporates “Bright Mode” that boosts image brightness up to four times, realizing HD video capture at 240 fps equivalent for smooth slow motion playback and high speed continuous shooting. The sensor has an HDR mode and also adopts a newly developed low power circuit design that reduces power consumption to 85% that of T4K35, an 8MP sensor in mass production. Sample shipments start now with mass production scheduled for April 2015 with volume 8M units per month. "With pixel size scaling down, design rules for color filters should follow the trend and allow the color filters to be scaled down as well, but due to specific processing features of the color filters the scaling is challenging and painful. Introducing new materials is a common approach for improving color filter scaling, but light transmission, process controllability, yield, delivery, and overall optical performance could be sacrificed." "Clear filter 106 and color filters 108, 110 and 112 are formed on surface 103 of optional planarization layer 104. A first hard mask layer 114 and a second hard mask layer 116 are formed over clear filter 105 and color filter material 107, while only second hard mask layer 116 is formed over color filter material 109. In the illustrated embodiment no hard mask layer is formed over color filter material 111, but in other embodiments an additional clear layer can be formed over filter material 111 and second hard mask layer 116. Hard mask layers 114 and 116 are clear (i.e., substantially colorless) and optically transparent in a range of wavelengths that includes at least the wavelengths of the color filters. In the illustrated embodiment, one or both of hard mask layers 114 and 116 can be made of the same clear material as clear filter 106. In one embodiment hard mask layers 114 and 116 are oxide layers, but in other embodiments other materials can be used provided they meet optical performance and manufacturing requirements. By using oxides or other materials with good light transmission properties, the “old” low cost, mature, optimized color filter materials can extend their application to pixels of any size, the only limit being patterning resolution, which is smaller than the shortest wavelength of the visible light." Albert Theuwissen publishes a next post in "How to Measure MTF" series. This one talks about the improvements of slanted edge approach by means of column oversampling. RTT News, Business Weekly, Optics.org, Electronics Weekly: e2v is to acquire Seville, Spain-based Innovaciones Microelectronicas SL, also known as AnaFocus for up to 34.2M euros. The initial cash purchase price of 29.2M euros is made up of 26.5M euros cash consideration for the business, and assumed net debt of 2.7M euros. The AnaFocus management team is staying with the business and can achieve an earn-out of up to 5M euros in cash, dependent on value generating 'stretch' integration targets including revenue growth. In 2013, AnaFocus had revenues of 5.6M euros and EBITA of €80,000. In the calendar year to December 31, 2014 AnaFocus is expected to generate sales of approximately €11M. e2v technologies’ Group CEO, Steve Blair, said: "AnaFocus adds technology, people and customers to our machine vision business. It strengthens our position in the market, bringing to e2v a successful management team with deep technology capabilities and close relationships with customers that complement e2v’s relationships. The strength of the AnaFocus team, and the e2v worldwide sales and customer support channels they can now access, will help us to accelerate our opportunities in this fast-growing business. We see immediate opportunities to apply the technical capabilities of AnaFocus to provide enhanced offerings to our joint customers. I am delighted we are making this acquisition and I am pleased the AnaFocus team are joining us." e2v expects the acquisition to complete during September 2014. AnaFocus will become an integral part of the machine vision business within e2v’s High Performance Imaging division, which grew by 26% last year. Both e2v and Anafocus use TowerJazz as their sole foundry partner for CMOS image sensors. Business Wire: Aptina has completed the purchase of CFA processing and imager probe assets from Micron. Following the purchase, Aptina will operate a fabrication facility in Nampa, Idaho that employs nearly 100 employees who will work closely with Aptina’s existing pixel optics research and development team. In addition, Aptina will hire management, development and support roles to bring its Idaho presence to approximately 250 total employees. Cambridge Mechatronics Ltd. (CML) announces that the first customer for its smart metal alloy (SMA) OIS actuators is Foxconn. In a separate announcement, CML names its manufacturing partner, Hutchinson Technology Inc. (HTI). CML and HTI have been developing OIS actuators in collaboration with Foxconn's camera division for over 18 months. Following design wins in May, smartphones with cameras built by Foxconn using SMA OIS actuators will reach the market in September this year. In June, CML announced that it will be making its OIS actuators for 1/3" to 1/2.3" image sensors with up to 20MP resolution. The OIS actuator is attached between the image sensor and AutoFocus actuator. The motion of the OIS actuator moves the lens relative to the image sensor, counteracting any shake measured by a gyroscope and thereby stabilizing the image. CML's OIS actuators force and motion are created by Shape Memory Alloy (SMA) wire - a smart material that provides huge force and strain when heated with an electric current. CML says it is able to make smaller and lower cost products than VCM manufacturers. University of Bonn, Germany conducts Workshop on CMOS Active Pixel Sensors for Particle Tracking (CPIX14) on Sep. 15-17, 2014. 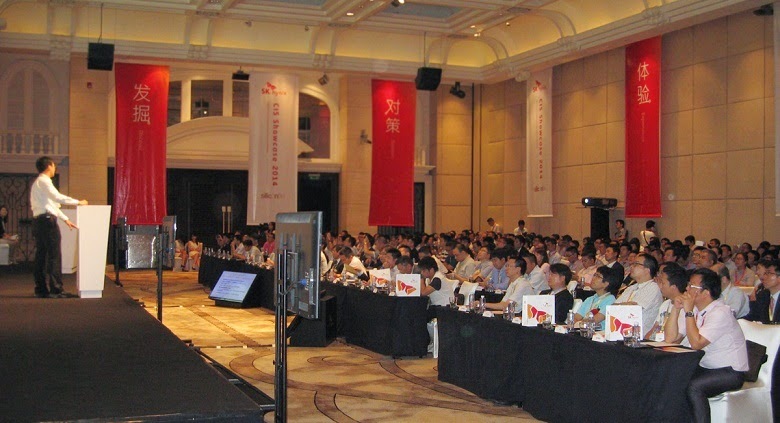 Although the workshop is fully booked, the organizers offer a live broadcast over the Internet for the presenters who agree - the world's first for an image sensor event. Reuters: Mobileye's NYSE IPO on Aug. 1st values the vision-based ADAS company at about $5.31 billion, higher than planned. The company estimates that its products were installed in about 3.3M vehicles worldwide as of March 31, including BMW, Honda and Tesla Motors. By the end of 2014, it expects its technology to be available in 160 car models from 18 original equipment manufacturers worldwide. Update: The valuation has jumped to $7.86B in the first day of trade.